Manchester United secured their place in this year’s FA Cup final and remain in the race to finish in the top four which could have saved Louis van Gaal’s job following criticism earlier in the season. LVG seemed destined to lose his job at one stage of the season as injuries mounted and results were hard to come by. It could be argued that players such as David de Gea, Anthony Martial and Marcus Rashford have kept the Dutchman in the hot seat as United have mostly failed to impress this season. The pressure is still on the former Netherlands boss to maintain their current form and secure Champions League football for next season. If not, the Red Devils could be set for another managerial change. The favourite for the job is Jose Mourinho. The Portuguese tactician has been out of work since his dismissal from Chelsea in December following a dismal start to the season for the Blues. The 53-year-old quickly emerged as the favourite to take over from Van Gaal at the end of the season. Despite heavy investment under van Gaal’s tenure, United did not splash the cash in Mourinho’s first transfer window. They made just one signing all summer. Hakan Calhanoglu was signed from Bayer Leverkusen for around £19m. Calhanoglu is widely regarded as the best free-kick taker in the world and added creative spark to the United midfield. Youth prospects Will Keane and Andreas Pereira left the club on loan to MK Dons and Bristol respectively. The January transfer window was also quiet with just three signings. Uruguayan centre-back, Martin Caceres, joined the club for just over £10m but a hernia injury put an unfortunate end to his season before it started. Mourinho was clearly not impressed with Matteo Darmian’s performances at right-back meaning Brazilian defender, Mario Fernandes, was bought for around £12m in order to sure up United’s defence. Experienced defender, Pepe, also arrived on deadline day from Real Madrid for just over £2m. 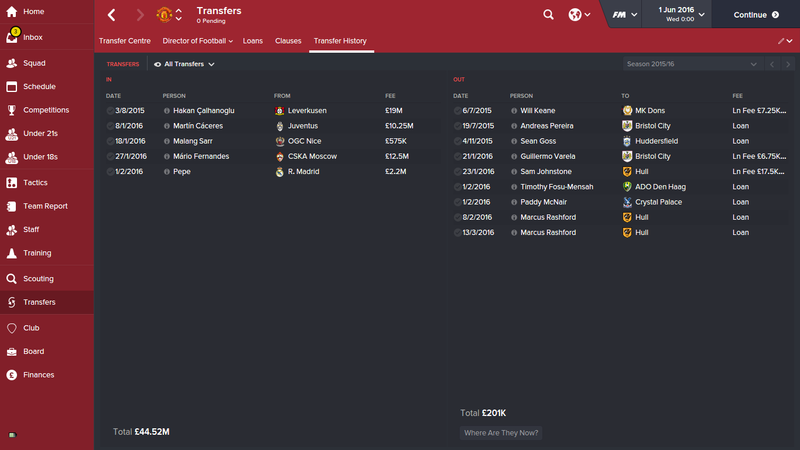 More players left on loan including Guillermo Varela, Sam Johnstone, Timothy Fosu-Mensah and Paddy McNair. Despite playing a huge role under LVG, Rashford was loaned to Hull City until the end of the season. Injuries have forced Van Gaal to experiment with his formation this season but Mourinho choose to operate in a 4-2-3-1 system. Fernandes quickly displaced Darmian at right-back in January, Daley Blind partnered Chris Smalling at centre-back with Luke Shaw at left-back following a devastating leg injury. Bastian Schweinsteiger partnered Ander Herrera in the centre of midfield behind an attacking trio of talent. 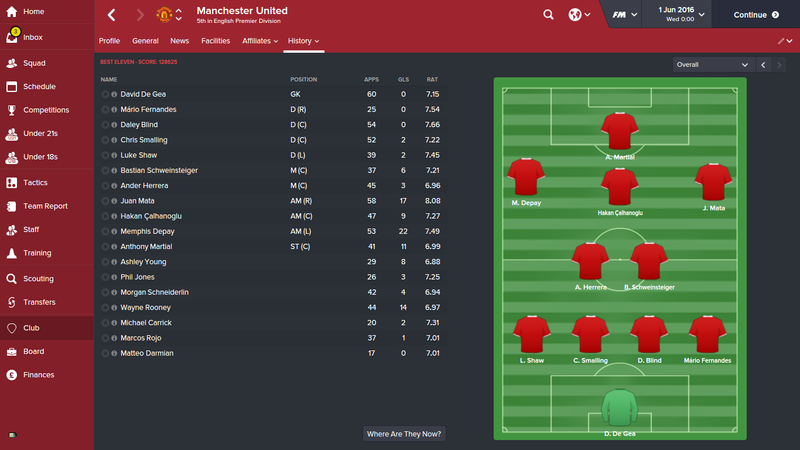 Juan Mata took his place on the right with new signing Calhanoglu operating through the middle. Memphis Depay lined up on the left of midfield and Anthony Martial led the line for the Red Devils. 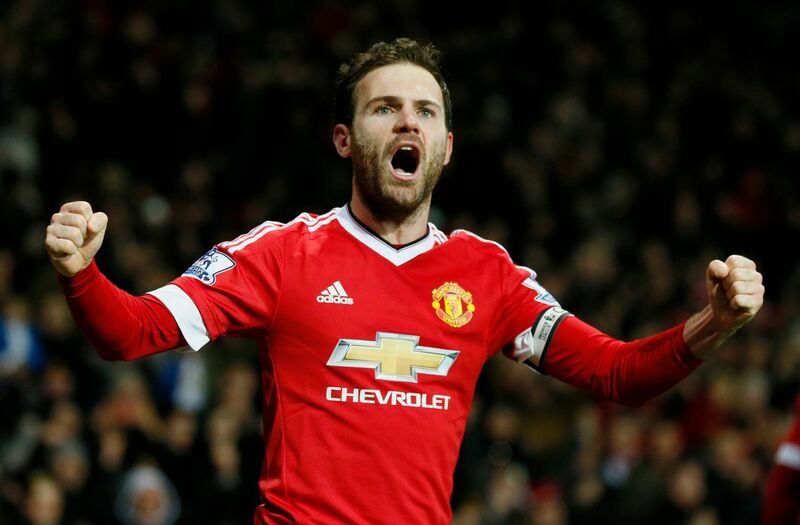 Remarkably, the star of the season under Mourinho was Spanish midfielder Juan Mata. It was the Portuguese who sold Mata to United during his spell with Chelsea due to the emergence of Brazilian midfielder Oscar. The former Valencia playmaker netted 17 goals and registered 20 assists with an average rating of 8.08; which was the second highest in the Premier League behind Mesut Ozil. It was Depay who finished as the club’s top goal scorer in Mourinho’s first season after putting a poor debut campaign behind him. The Dutch winger finally re-discovered the form he showed during his time with PSV and was one of the league’s best performers under the former Porto boss. No players from Manchester United made the PFA Team of the Year which was dominated by stars from Arsenal and Manchester City. 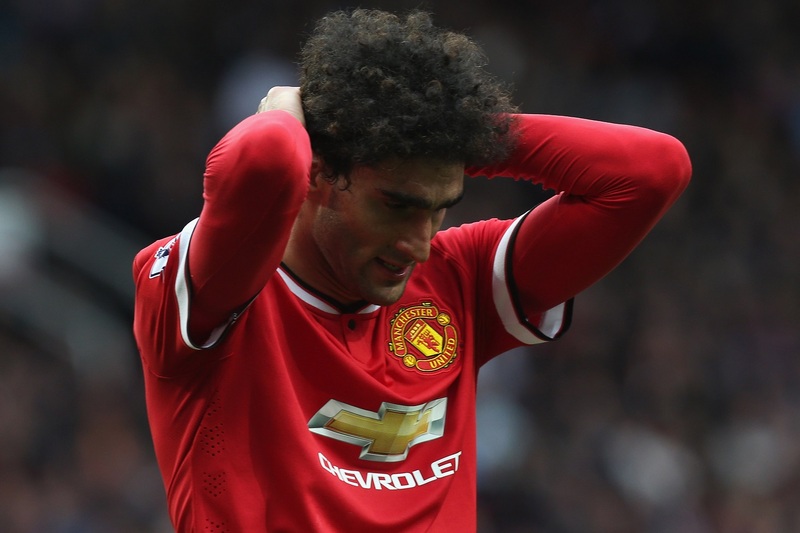 It was a season to forget for Marouane Fellaini who could not earn his place in the side who made just two starts and ten substitute appearances in all competitions. The Belgian midfielder has 17 appearances for United this season but was deemed surplus to requirements when Mourinho took over. Adnan Januzaj also struggled for game time under Mourinho, making just eight appearances despite averaging a rating of 7.03 when he did play. Michael Carrick also endured a miserable time following LVG’s exit and was soon demoted to the Under 21 squad. There was to be no first-team football for Jesse Lingard who did not do enough to earn his place in the senior squad. It was another season of misery for United supporters as Mourinho failed to change the club’s fortunes. United failed to reach the top four of in the Premier League yet again, finishing in fifth, four points behind Arsenal in fourth. To make matters worse, it was bitter rivals Manchester City who lifted another Premier League crown following Pep Guardiola’s appointment. United finished 17 points behind their noisy neighbours. 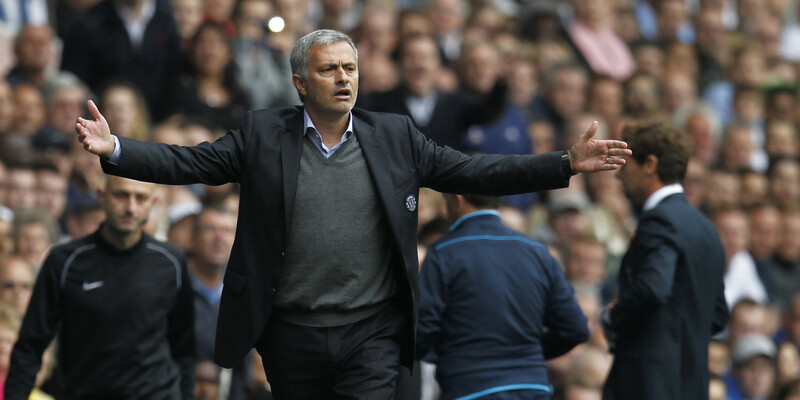 Mourinho also managed to guide his side to the final of the FA Cup but was beaten at Wembley by Manchester City. The Citizens also got the better of United in the Capital One Cup quarter-final meaning Europe was the only chance of silverware. Surprisingly, United lost in the play-off rounds of the Champions League to CSKA Moscow meaning they had to settle for a place in the Europa League. After navigating the group stages due to the electric form of Depay, United was knocked out in the quarter-final by eventual winners Tottenham Hotspur. Not even a world-class manager like Mourinho was able to bring glory back to Manchester United at the first attempt. It was another season to forget with no Champions League football yet again. More investment was needed at the start of the season as their domestic rivals left them behind in the race for the title and a top four finish. Ultimately, the club’s shortfalls in Europe piled pressure on Mourinho in his second season in charge. Do you think Mourinho will become the next Manchester United manager? Comment below! How Would Steven Gerrard Fare As Liverpool Manager? There are 20 possibilities before a season starts for any club. So imagination can take you anywhere. We got to wait to see what happens, but what will happen with Mou we can hope is the best that can happen for ManU! !